There is no need to store ISOs with large file size. It's a good idea to convert all your ISO files to smaller MP4 videos without quality loss for convenient backup and playback. Or you can consider any other video formats like MOV, MPG, H265 and more. With the best ISO to MP4 ripper, you’re able to convert ISO files in the easiest way while keeping good quality. Why Do People Convert ISO Files to MP4? Yes, many people would like to download or create ISO image files of DVDs for digital backup on hard drive, external disk or online storage system. ISO image is an archive file with the extension of .iso composed of all the data contents of an optical disc. It will keep the original quality of a DVD. However, an ISO image is not a video file itself so you cannot directly play ISO file individually. Meanwhile, the file size of a 90-minute DVD ISO image always ranges from 5 GB to 8 GB, which takes up too much space. MP4 is one of the most popular video formats compatible with most smartphones, tablets, TVs, devices, media players, game consoles and video editor software. It's the best choice to convert ISO to MP4 so as to play, edit and share videos conveniently in a smaller video size. 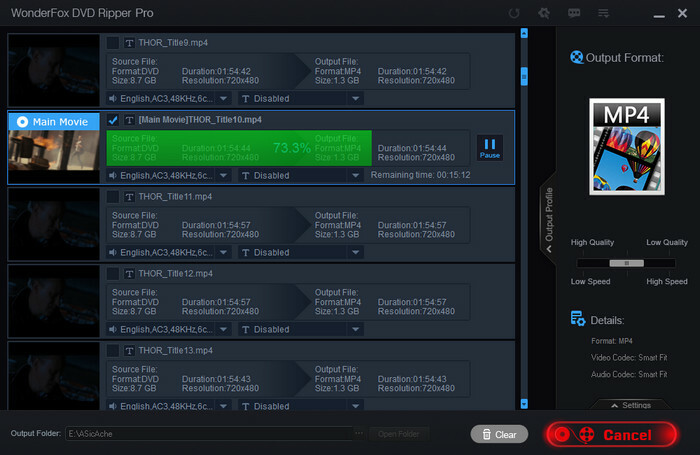 To deal with ISO convert to MP4, you need a professional ISO ripper. WonderFox DVD Ripper Pro, as the best Windows DVD ripper, is capable of resolving problems like “How to convert ISO files to mp4 or how to convert disc image file to mp4” with the fast ripping speed. And it’s a three-step ISO file converting process. Just follow my instructions. Click "ISO Image" button to load ISO image file. All movie titles will be detected and listed in few seconds after analyzing. Additionally, just as the image below shows, you can add DVD Disc or DVD Folder to this program as well. Meanwhile, the right main title or if it's a TV series DVD, all episodes will be marked automatically. Also, this ripper can serves as a great media player, so you can preview the video by clicking "Play" button on the left. Tips: You can select sound track or add subtitles and of course remove subtitles from DVD film at this step. 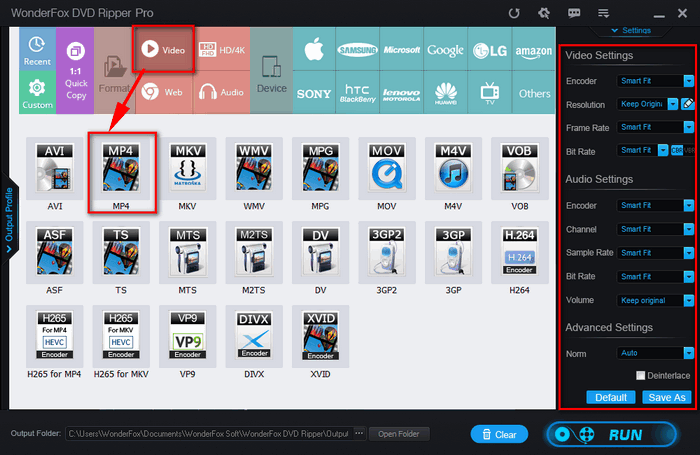 This ISO converter also empowers you to rip DVD disc to video or convert VIDEO_TS folder. Click "DVD Disc" or "DVD Folder" button to go ahead. 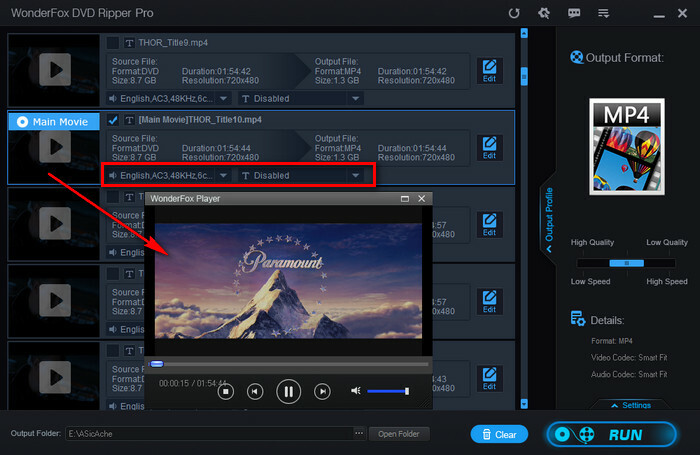 Open the output format menu on the right side and then select MP4 icon in the “Video” part. 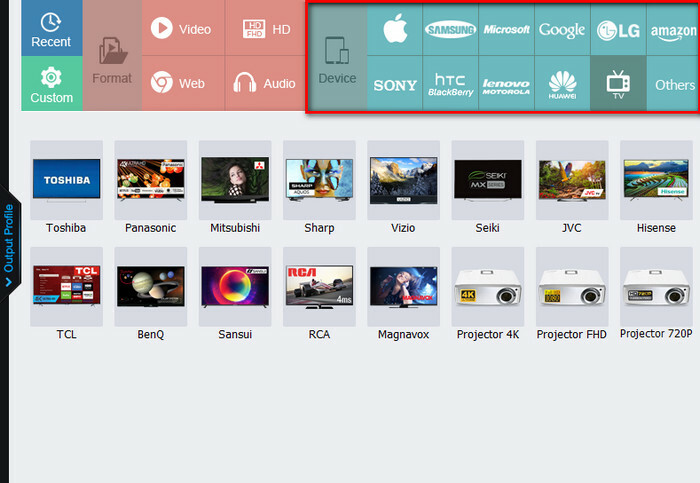 In addition, there are 300+ video, audio formats and devices here. You can also convert ISO to MKV, convert ISO to AVI and even convert ISO to Andriod and iPhone for easy viweing. You don't need to worry about the compatibility problems as this program has provided a “Smart Fit” for all profile. You only need to select the optimized profile and go to the next step. Optional - For advanced user, you are allowed to specify the parameters by clicking "Settings" button in the lower right corner. Here you can change video resolution, bitrates, encoder, frame rate, boost volume, etc. Once you finish the two steps above, set output path and click "RUN" button to start to fix the how to convert ISO file to MP4. Meanwhile, it's a process of reducing video size from 6-8 GB to around 1 GB, so that you can save more storage space. Amazing, isn't it? So this is the tutorial for how to convert an ISO file to MP4. Please share it with more people looking for an answer. And do make sure is it legal to rip DVDs in your country. Moreover, if you want to view ISO file or DVD disc on HDTV, 4K TV or some portable devices but are afraid of the compatibility issues, this converter will also work like a charm. For instance, you can cast DVD to HDTV via Chromecast, play DVD on 4K TV, watch DVD on iPhone 8/8 plus. It sets the best parameters for almost all common and hot gadgets as the picture below. See how easy for watching your ISO on device. Just select your device model from the Device tab the program provides. New devices are keeping updated and supported. Feel free to download this almighty ripper and it will never let you down. To rip ISO to MP4 format, a powerful and user-friendly ISO converter is more helpful. Take the following main factors for reference to choose the best one. A user-friendly and intuitive interface that without any third-party toolbars or software can make it easier for you to operate and handle this software. In view of the truth that many of you do not have the need to frequently download software; they will not uncheck the boxes associated with the software at installation time. Besides MP4, the software should support all popular formats and portable devices, and even more, for example, Apple devices, Android devices, and smart TVs. A good ISO converter is supposed to compress a large ISO file to a smaller MP4 file, but maintain the highest quality. A high processing speed ensures high efficiency of conversion. To take all the above factors into account, WonderFox DVD Ripper Pro is highly recommended for its satisfactory performance on each factor. Why not back up your ISO images (DVD discs and DVD folders) to digital files with the most effective tool now?